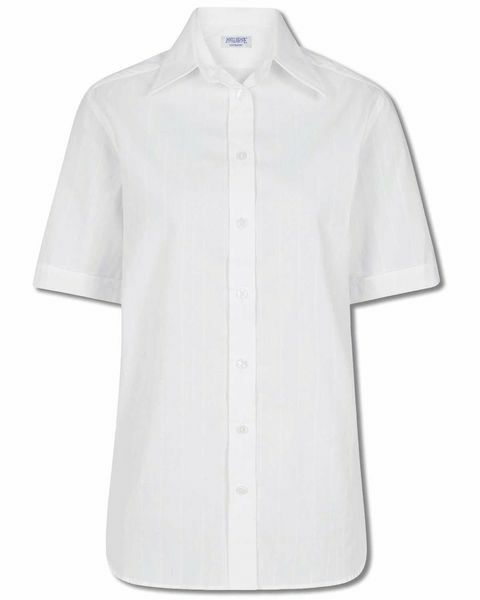 Good quality, comfortable, versatile, white shirt - exactly what I wanted. I was extremely pleased with my purchase. The blouse fits very well and washes and irons beautifully. "Good quality, comfortable, versatile, white shirt - exactly what I wan ..."
Ladies classic style blouse cut from pure cotton with delicate self stripe. The classic cut of this blouse and 2 sleeve options makes this an essential addition to your wardrobe. Two-piece collar and gently rounded hem. Long sleeved style with button cuff, short sleeved style with mock turn back hem.